There once was a duck who had the bad luck to live with a lazy farmer. 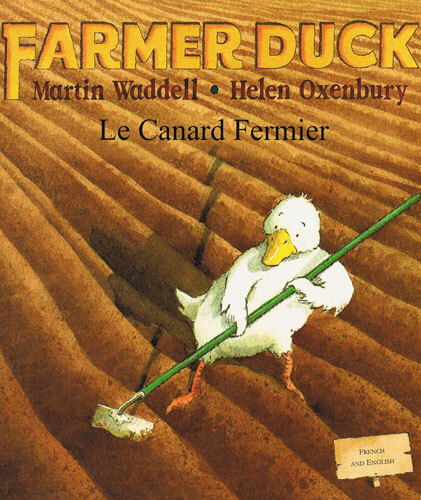 While the duck worked, the farmer lay in bed - until one day the other animals decided to take action!Enchanting artwork and bilingual text will help introduce young children to a foreign language in a natural and relaxed way. This book is a high-quality dual-language picture book, suitable both for children who are learning and reading French and English in parallel and those being introduced to French or English as a second language. This book is a gift for my Grandson who will be 2 this week. He is being bought up bi-lingual, his Dad is French, and this will be added to his growing collection of bi-lingual books. Its such a lovely story. I'm hoping he will help me with regaining my knowledge of the French language when he gets older.